Hello Readers, hope you found our part 1 blog interesting. 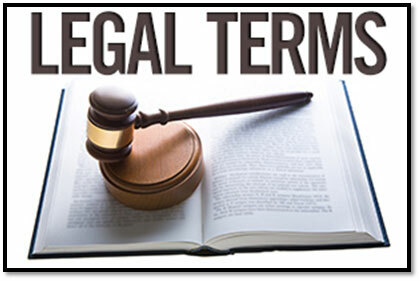 We have listed and simplified a few more commonly used legal terms at work and in daily use. Do reach out to info@kelphr.com and share us your feedback or visit our website www.kelphr.com to read our other blogs. It is such an adjudicating body on whom the power of deciding cases are given. This power has to be exercised in a very non-arbitrary manner. Such a tribunal is mainly established under any enactment. For e.g. Departmental Inquiry under the Industrial Disputes Act, POSH. In legal phraseology, this term means, something which has a resemblance. This also implies that even though that two things look similar but they do have some intrinsic differences in them. When we use the term quasi-judicial, we basically mean that any officer or any authority has been given the powers of looking into the matter judicially which has been expressly given to them through a direction. Such an officer does not have all the powers like the judiciary of India. For e.g. : POSH internal committee has a quasi-judicial powers, under the Sexual harassment at workplace Act. It’s a decision of the court which is given without the presence of all the parties. This is mainly done in the court of law to stop the further delay of the legal process due to fraudulent interests of the parties who have not been coming to the court for the case. For e.g. : If a civil case for property has been filed by person X against person Y, and Y does not appear in the court even after the summons (an order to appear before the court) being sent from the court. The court may pass an ex-parte order for the case in the absence of person Y and this could mostly be in the favour of person X.
Literal meaning of this term is one thing for another. Whenever we give one thing for value of another thing. For e.g. : Employer gives a preferential treatment to an employee of giving a pay hike or promotion in return of a sexual favour. This term helps you specify one of the important things among other things. For e.g. : XYZ company has filed a case inter alia for breach of contract. This means that the Co. has filed case for breach of contract also. Status quo is a Latin phrase meaning the existing state of affairs, particularly with regard to social or political issues. When we talk about the status quo,, however, we often mean it in a slightly bad way. When people want to maintain the status quo, they are often resistant to progress.